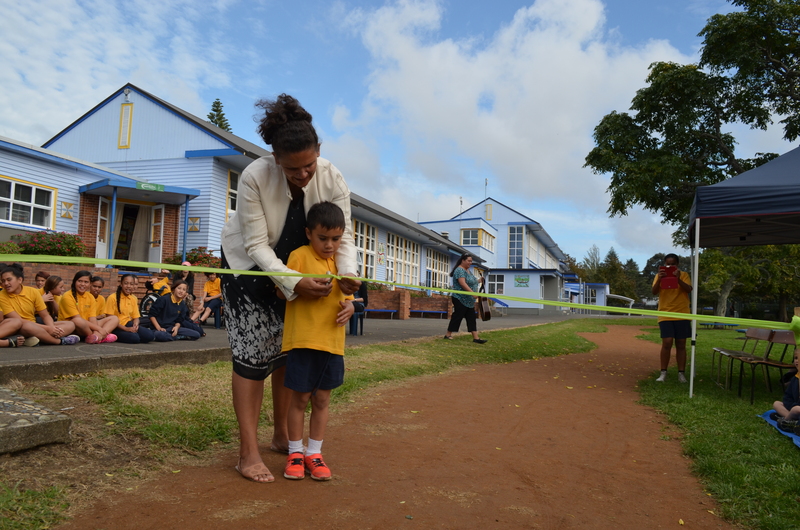 West Park School’s track was finished a little while ago and has seen plenty of use already, but this week saw the official opening of the facility by Wellington mayor Celia Wade-Brown. This is the second track opened through WCC’s Bikes in Schools project, with more planned. The Freemans Bay track opened back in March this year (our original blog and pics are here), thanks to support from a range of sponsors. 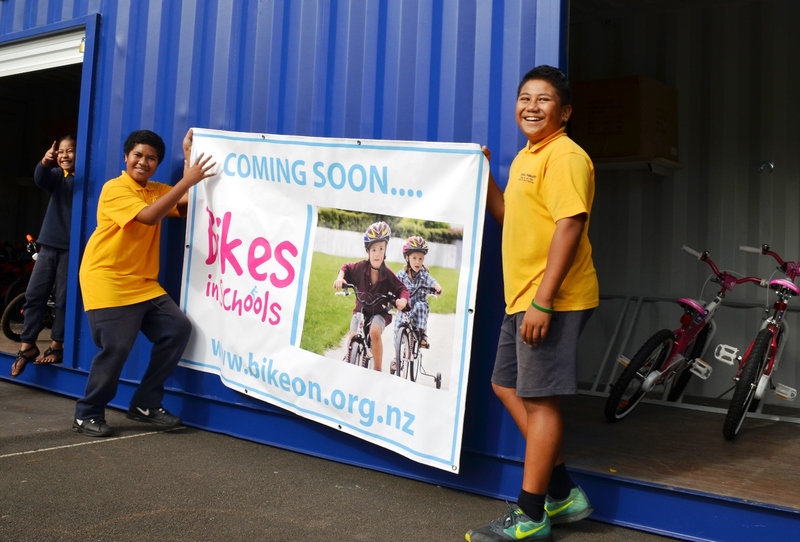 It was opened by Associate Minister for Education Nikki Kaye MP, and we were sure at the time that the kids were going to really love using it because the school is located in inner-city Auckland, where there’s not much space to get out and play – especially on bikes. The number of kids biking to school has increased – the school has had to look at installing cycle racks for the first time. It started happening before the track opened, when groups of kids came at the weekend to try it out. “In nearly 20 years’ involvement at the school, that was the first time that I’d seen kids bringing their bikes to the school grounds”. 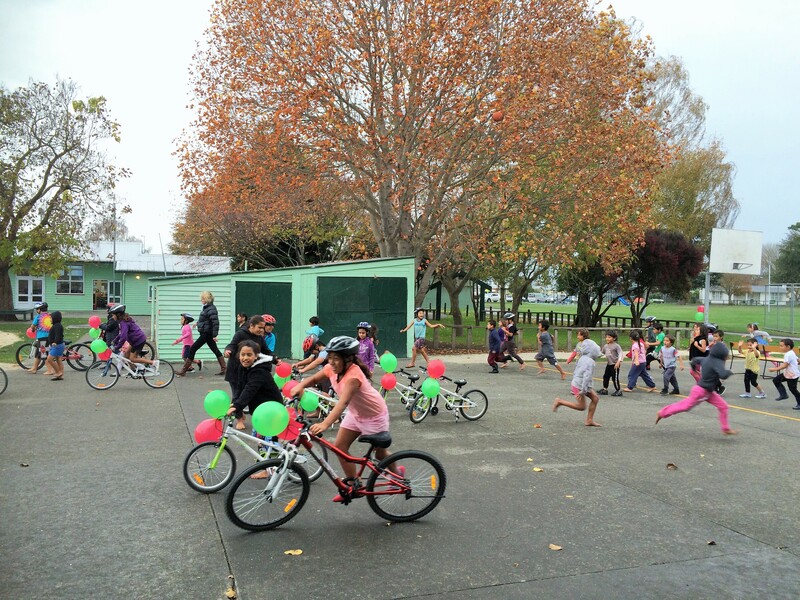 Good news from Hampton Hill School in Tawa, Wellington, where the school has become one of the latest around the country to plan a new Bikes in Schools project. Inspired by the success of the project at Titahi Bay School, Boards of Trustees member Jill Day thought that something similar would work well at Hampton Hill too. School principal Kelly O’Leary (above left with Jill) agreed that the project would fit in well with the school’s goals – “We want healthy, engaged children and we want children who risk take”, she said. 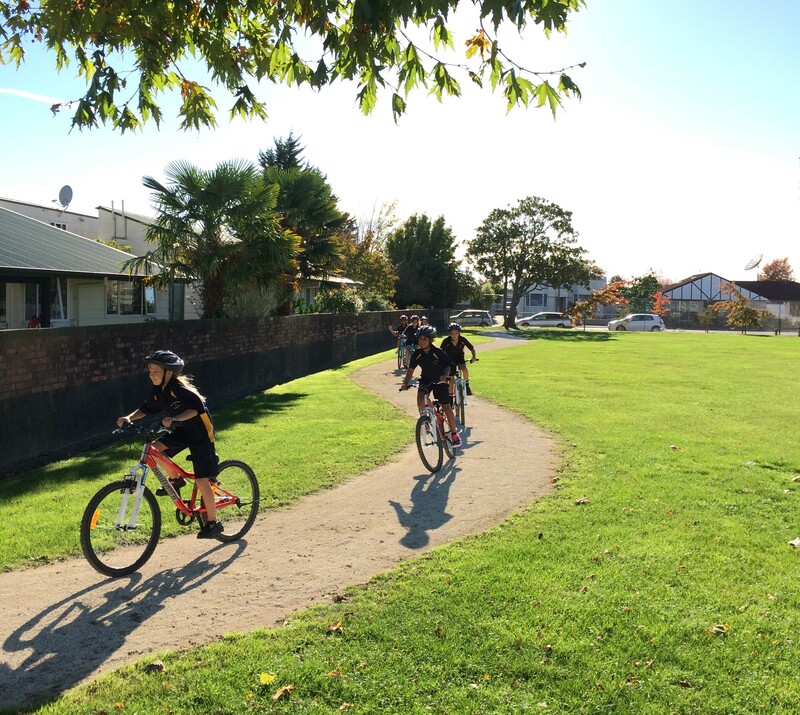 An added advantage is that a new cycle trail through Tawa itself has just been completed, so the school sees the opportunity to teach kids to ride in the safe environment of the school grounds, then let them loose outside school to take full advantage of the new trail outside. It sounds like the Tawa community are already getting behind the scheme, too – one parent has already offered to teach children how to service the bikes. Best of luck, Hampton Hill school in your fundraising efforts – we’re really looking forward to seeing the completed facilities! 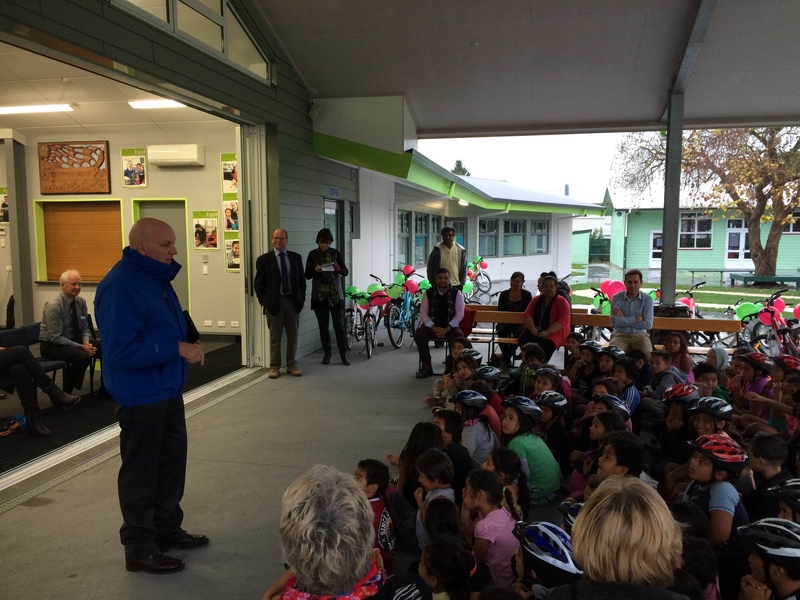 Wellington’s wild weather finally reached Hawkes Bay on Friday, but even that wasn’t enough to dent the enthusiasm of the 120 kids at Camberley School, Hastings – at the official opening of the new cycle tracks at the school and round the adjacent Kirkpatrick Park. The sky opened just as things kicked off, prompting a mad rush to the cover of school hall for kids and visitors. But it didn’t dampen the excitement! Camberley as an area has had some hard knocks in the last couple of years. But principal Pat Watson said that the school now had a unique community asset that was already being used by not just kids but also by their parents and others in the community too, and that he’s been surprised by how popular path the path has become already. The school itself has a limesand track round its own playing field, which joins a longer concrete path winding it’s way round Kirkpatrick Park next door – built by Hastings District Council as part of it’s iWay project. Hastings Councillor Sandra Hazehurst said that paths like this were all part of HDC’s wider investment in getting local people cycling. This joint school/council collaboration has worked really well at Camberley School and it would be great to see similar elsewhere. Councillor Malcolm Nixon threw down the gauntlet, challenging principal Pat Watson to a bike race. But although it was just too wet to race on Friday, we’re going to hold him to that one. Watch this space! Thanks to Eastern And Central Community Trust for their contribution – it is much appreciated. 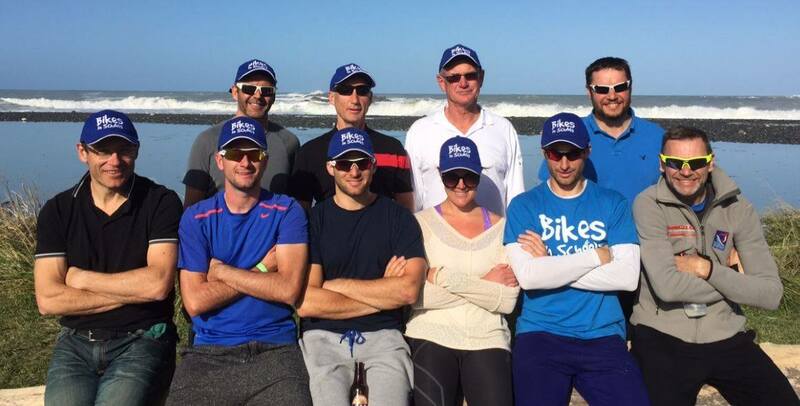 Also to Sport Hawkes Bay for their help with the initial cycle skills training, and to the Rotary Club for helping assemble the bikes. 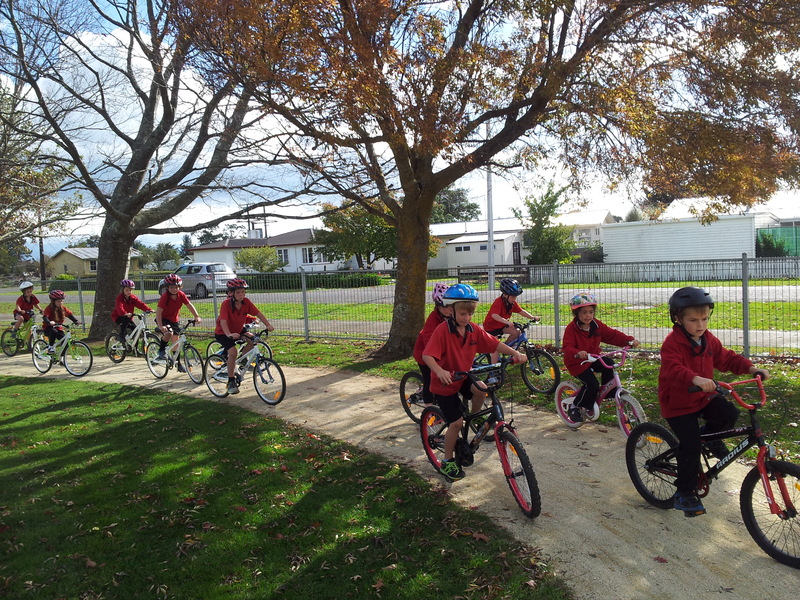 School track openings usually see a lot of kids on bikes, but Takapau School in Central Hawkes Bay broke all records last Friday when the entire school’s 120 students pedalled round to celebrate the opening of their 3 new tracks. CHB’s mayor Peter Butler did the honours to officially open the track, and was even persuaded to join the mass of cyclists for a quick turn round the track. We were also lucky enough to be joined by some seriously talented bike riders – professional mountain bikers Brook McDonald and George Brannigan. Always up for a challenge, George and Brook took on two specially selected young riders from the school for a race (and gave them both half a lap head start to give them a fighting chance – maybe they were a bit too generous there though….). Another Auckland school snips the ribbon on a brand new track – well done to Tamaki School in Panmure, Auckland! 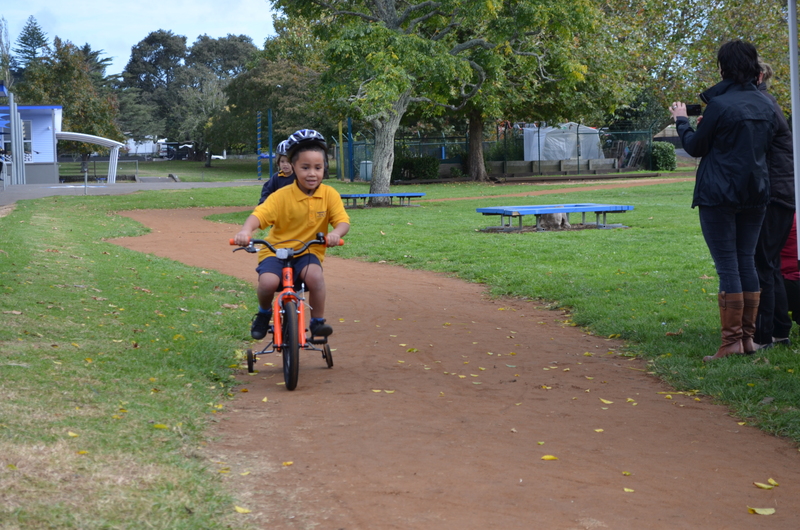 The school now has a fantastic 500m riding track, a pump track, a fleet of 50 bikes and a helmet for every kid. This was all thanks to generous contributions from Sport Auckland, the ASB Community Trust, the Lion Foundation, Maungakiekie-Tamaki Local Board and Auckland Transport. Thanks to Tamaki School for a great day!